This article aims to describe how to optimize Indonesian products, such as good and service, to a global market. The global market emerges due to globalization in a modern economic era. We can access anything easily, although these needs are not produced domestically. In a global market, everybody can make transactions across national borders. Therefore, Indonesian products must also be able to compete in the global market. Natural rubber is one of the commodities that have potential in Indonesia. Indonesia is one of the largest rubber producing countries in the world, ranks second after Thailand, followed by Malaysia, Vietnam, and India. Land in Indonesia such as Riau, South Sumatera, North Sumatera, and Jambi, is suitable for planting rubber trees. As a potential commodity, Indonesian rubber products are exported to industrial countries that require rubber raw materials. Indonesia's rubber export destinations are the United States, the People's Republic of China, Japan, Singapore, and Brazil. The competitiveness of Indonesian rubber commodities in the global market is quite good today. If developed better, then Indonesia can be the largest exporter of rubber in the world, so it can increase economic growth. Although the price of rubber in the global market is declining, the export of Indonesian rubber is expected to run well. HARAHAP, Nurichsan Hidayah Putra; SEGORO, Bhima Agung. Analisis Daya Saing Komoditas Karet Alam Indonesia ke Pasar Global. 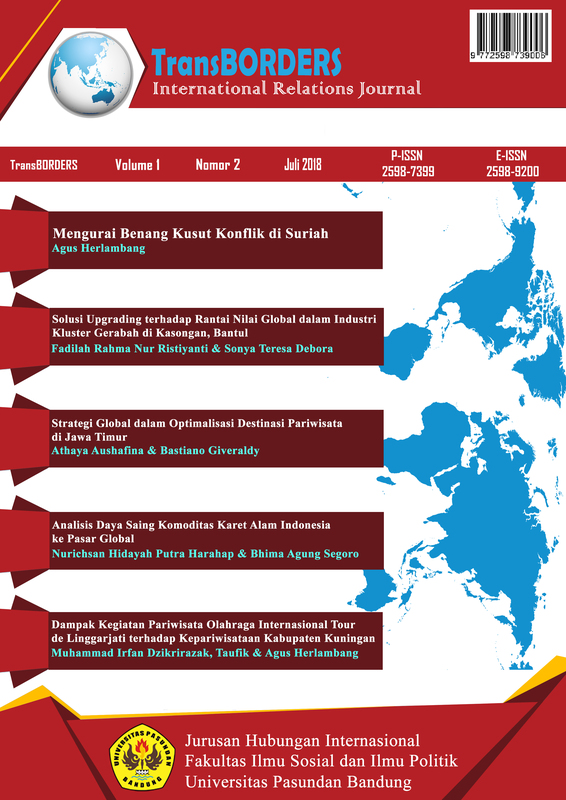 TRANSBORDERS: International Relations Journal, [S.l. ], v. 1, n. 2, p. 130-143, july 2018. ISSN 2598-9200. Available at: <http://journal.unpas.ac.id/index.php/transborders/article/view/992>. Date accessed: 25 apr. 2019. doi: http://dx.doi.org/10.23969/transborders.v1i2.992.